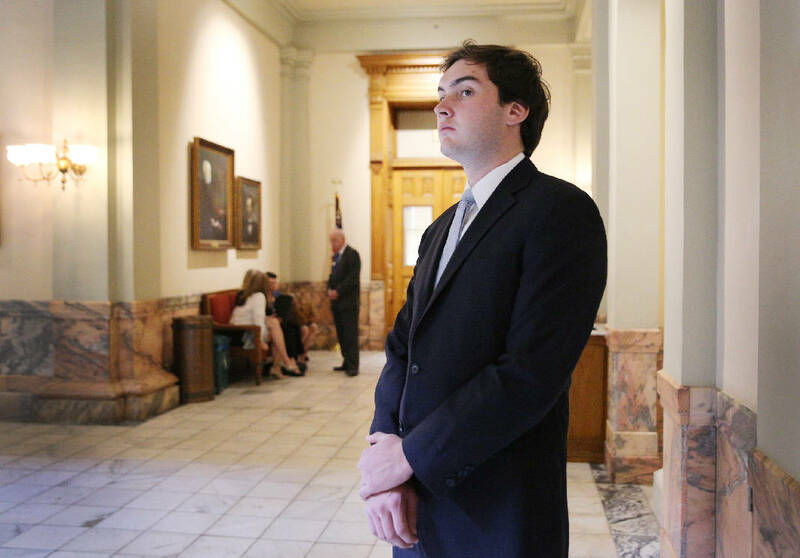 Colton Moore, 24, watches a ceremony happening in a lobby area of the Georgia State Capitol Thursday, March 29, 2018 in Atlanta, Ga. Moore, who is a candidate in the upcoming election for the District 1 House of Representatives seat in Georgia, was spending a few days at the Capitol to better prepare himself to take on the job should he win the election later this year. 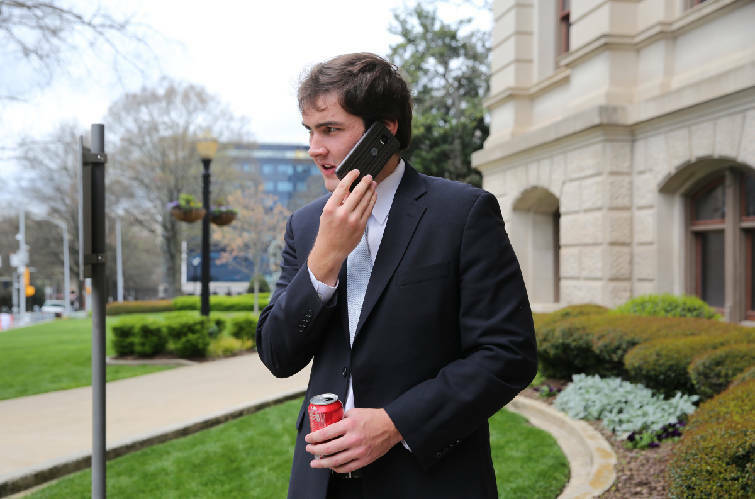 This story was updated May 28, 2018, at 6:55 p.m.
Colton Moore, 24, makes a phone call before returning to the gallery of the House of Representatives at the Georgia State Capitol in Atlanta, Ga., Thursday, March 29, 2018. Moore spent Wednesday and Thursday shadowing his opponent in the upcoming election, State Rep. John Deffenbaugh, R-Lookout Mountain, and watching the final legislative session for the Georgia House of Representatives. State Sen. Jeff Mullis, R-Chickamauga, was on the other end. He congratulated Moore, told him he looked forward to working with him. He also gave him a warning: Be careful how you talk about other lawmakers. In an April 9 Times Free Press article, Moore criticized multiple state representatives while watching them on the last day of the legislative session. He thought State Rep. David Clark, R-Buford, wore an obnoxious suit. He said State Rep. Emory Dunahoo, R-Gillsville, was "lollygagging" with a colleague before the 10 a.m. session. And when the session started late, he said Speaker of the House David Ralston, R-Blue Ridge, needed to step up and bring the chamber to order. Moore, 24, intends to arrive at the state capitol in January with education reform bills already in hand. But those bills won't be worth the paper they're printed on without help from other lawmakers. "A lot of people get elected and think they're going to change the world their first term," said Mullis, who has been in office since 2001. "It takes people several years and a couple or three terms to get their feet on the ground." Mullis, the Senate rules committee chair, who decides which bills reach the floor for a vote, advised Moore to build a relationship with Ralston. "I would be certain that, from his first article, several members of the legislature and probably the speaker's office are well aware of his comments," Mullis said. "He will need to smooth things over, and he can. They're going to need his help on some pieces of legislation." Ralston said someone sent him the previous article. He said he wasn't too worried about Moore's comments. "I just took it as somebody who was not really informed about how we do things," he said. " All of us have been new representatives at one point in time. The ones who become the most successful are those who, when they come in, learn the process and listen and study and certainly don't pretend to have all the answers." Traditionally, Ralston said he schedules three days in November to meet with new members of the House. He tries to learn their interests and place them in committees they're interested in. Moore has no intention of starting slow. He proudly describes himself as a workaholic. He is inspired by former President Teddy Roosevelt's freshman year in the New York State Legislature, how he willed his way through older lawmakers who warned him to slow down. This summer, he is recruiting teachers to form a committee to recommend legislative changes. He plans to craft the bills later this year, before he is sworn in to office. "We're going to sit down and figure out state issues that can be easily changed and have the greatest impact for students," Moore said. While some lawmakers run their ideas by legislative counsel at the capitol, Moore doesn't trust that process. He said other representatives told him they were disappointed by going to the in-house lawyers. By the time the counsel finished writing their bills, he said, the meat of the concept was stripped out. Or the bills were different from what the representative intended. Instead, Moore plans to run his ideas by friends finishing law school. Then there were the lobbyists. Moore, who listed his cellphone number on his campaign website, got calls from policy advocates in Washington, D.C., and Ohio. "My phone was a triage," he said. "I was just trying to put Band-Aids on different things. I was so swamped with congratulations." Cole Muzio, of the Family Policy Alliance, was among the callers. Focus on the Family founded the Alliance, which advocates for religious freedom, school choice and anti-abortion bills, among other policies. The group endorsed candidates in 16 Republican primaries this year but avoided the 1st District covering Dade and western Walker counties. From the outside, Muzio didn't think Moore had a shot. He was too young. And he didn't have any money. Moore said he raised a total of $4,000 — half of it his own. Deffenbaugh, on the other hand, had $37,000 on hand through the end of March. What's more, Deffenbaugh wasn't a controversial lawmaker. He avoided scandal. Defeating an incumbent state legislator like him is difficult. Cuzio, who has served as a political consultant on other races, including Dave Brat's 2014 upset of U.S. House Majority Leader Eric Cantor, is impressed. "Colton Moore was on nobody's radar that was watching races around the state," he said. "I didn't talk to anybody who said, 'Hey, watch out for this.' I've been in politics for a long time. This is one of the most shocking political upsets I've ever seen around the country." CORRECTION: This story was updated to correct the spelling of David Ralston's last name. In a previous version of the story, his last name was incorrectly spelled as Rolston in two paragraphs.